The Usuli Institute is proud to present its educational events via livestream when possible, and recorded for viewing online on our YouTube channel or as listed below. Our regular Halaqa (Circle of Learning) sessions cover both pressing issues confronting humanity today, as well as deeper investigations into the Islamic Intellectual tradition such as Original Qur'anic Commentaries (Tafsir) and the Meaning, Purpose and Effect of Prayer. In our Usuli Institute Conversation Series, we bring guests to discuss specific issues or hot topics. Be sure to follow us on Facebook for the most up-to-date notifications of events and new uploads. Grace Song is the Executive Director of the Usuli Institute, and regularly shares her personal stories, reflections and ideas in the introduction to each halaqa, presented here. She brings a unique voice to the Usuli Institute as a woman, an American-born-and-raised daughter of Taiwanese immigrants, a Muslim convert since 1994, before she knew Dr. Abou El Fadl, and ultimately as the wife and partner to a learned Muslim scholar. Her introductions seek to illuminate the importance of knowledge and the impact of the Usuli approach to everyday life as a Muslim in America - engaged in modern day challenges with a commitment to moral and ethical beauty and reasonableness in all affairs, while seeking the divine path. In the introduction to the Usuli Institute halaqa on Surah 101: al-Qaria, Director Grace Song shares her surprising observations about the people who convert to Islam, discusses what they experience in the early stages of conversion, and gives insight as to how to survive the early experiences of being a Muslim convert. She tells the story of how Dr. Abou El Fadl answered her question about the necessity of hijab when she was a young convert. Delivered 12 January 2019. In the introduction to the Usuli Institute halaqa on the meaning, purpose and effect of prayer, Director Grace Song returns to the question of vulnerability from her previous intro (8 Dec 2018), and answers two questions she received regarding strength versus vulnerability, and how to create goodness. She discusses the power of dignity, and shares personal stories on healing from trauma and sexual abuse, building empathy from pain, and how to build the habit of spreading kindness. Delivered 22 December 2018. In the introduction to the Usuli Institute halaqa on Surah at-Takathur, Executive Director Grace Song reacts to two separate efforts that look to increase human connectedness through a focus on authenticity and vulnerability: a Top 5 TED Talk of all time by Brene Brown (2010), and a new online effort in 2018, Loominary, which seeks to address the paradox of increase in global connectedness simultaneous to an increase in loneliness. She talks about these approaches from a Muslim perspective and gives perspective on finding one's true authentic self, owning vulnerability, and creating human connectedness from a Muslim point of view. Delivered 8 December 2018. In the intro to the Usuli Institute halaqa on Surah 104: Al-Hamaza, Executive Director Grace Song discusses the implications of the confirmation of Brett Kavanaugh to the Supreme Court from the lens of a Muslim, a woman and a convert to Islam. She calls out Muslim leadership to be relevant to today's problems facing our country, our youth and humanity; to actively demonstrate the virtues of the faith, or to step aside. She shares her own story and discusses the role of faith, God and serving humanity in healing. Delivered 6 October 2018. In the Usuli Institute halaqa on Surah 110: Al Nasr, Director Grace Song shares personal stories and reflections on the journey of praying and prayer as a Muslim over time. She discusses her ideas about prayer before she became Muslim versus afterwards, and how her feelings about and during prayer evolved from her early days as a convert to the present day. Most importantly, she emphasizes that prayer is the critical lifeline to the divine that should never be severed regardless of the circumstances. Delivered 15 September 2018. In the introduction to the Usuli Institute halaqa on Surah al Rahman, Verses 34 to 48, Director Grace Song discusses her most powerful role model for a Muslim woman, her mother-in-law Afaf El-Nimr. She discusses the most important lessons her mother-in-law imparted on her by living example on how to be a kind, loving, strong, empowered and divinely-oriented woman in our modern times. She also talks about the oppression facing the Uyghur Muslims in China, sharing a personal heart-breaking story. Recorded 11 August 2018. In the introduction to the Usuli Institute Halaqa on Surah al Rahman, Verses 26 to 33, Director Grace Song shares a personal story about one of the hardest yet most necessary transformations she had to make in her journey after becoming Muslim: overcoming her own racism. She talks about what it meant to be a racist, how to overcome it, and how her life changed in the process. She discusses why Muslims must own and address racism and lead the fight against racism. Excerpted from the Usuli Institute Halaqa of July 28, 2018. In the introduction to the third Usuli Institute halaqa (circle of learning), Director Grace Song further discusses the challenge of conversion to Islam in America and delves deeper into the story of her own conversion to Islam: her early reactions to the religion; how she reconnected with God; how she overcame her serious reservations about becoming Muslim through divine intervention; and her ultimate conversion. She shares stories of other converts she has come across in her work and evidence of similar divine intervention. She herself answers the four questions directed to converts on the www.usuli.org website, which invites story sharing, and addresses the disparity between the expectations vs. reality experienced by most converts. Finally, she offers ideas on the opportunity that God provides for Muslims through its converts. Delivered 4 February, 2018. In the introduction to the second halaqa of the Usuli Institute, Director Grace Song begins speaking in greater detail about her conversion experience and the costs, sacrifices and hard work involved in the difficult decision to convert to Islam in our times. She shares why it is important for those who are "born-Muslims" to have a better understanding of the convert experience and why converts represent a divine opportunity for the future of Islam. Delivered 6 January, 2018. 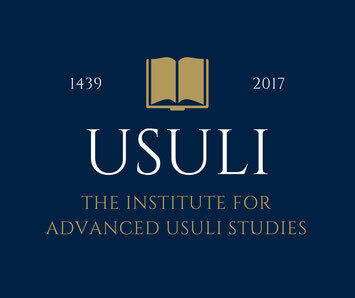 In the introduction to the inaugural halaqa (circle of learning) of The Usuli Institute, Director Grace Song explains some of the background to and backdrop of the founding of The Usuli Institute. She talks about why the effort is so personal to her as a convert to Islam, and describes the transformative power of knowledge in her journey as a Muslim. She describes why the library exists as the centerpiece to the search for beauty in Islam (also the book of the same name by Dr. Khaled Abou El Fadl) and is at the core and foundation for work at The Usuli Institute. Delivered 9 December, 2017.